Wrigley Field, home of the Chicago Cubs, hosted its first World Series game in 71 years last night (Oct. 29) and Chicago native and Fall Out Boy frontman Patrick Stump had the honor of singing the National Anthem for Game 3 of the World Series. Check out his performance below! Stump wasn't the only Chicago native represented that night as Bill Murray performed a unique rendition of “Take Me Out to the Ball Game” while impersonating Daffy Duck. Read More: Where do your favorite bands stand on the World Series? Stump, clad in a personalized Cubs jersey (that I think we all want now), had some familiar supporters in the crowd. Pete Wentz recorded Stump's performance and immediately posted it on his Snapchat story, remarking that “they brought the big flag for Patrick,” which is very easily seen in the background of Stump's performance. The band tweeted after Stump's performance, exclaiming that Stump “killed the national anthem,” and judging by the Cubs response, it's pretty clear that they agree. 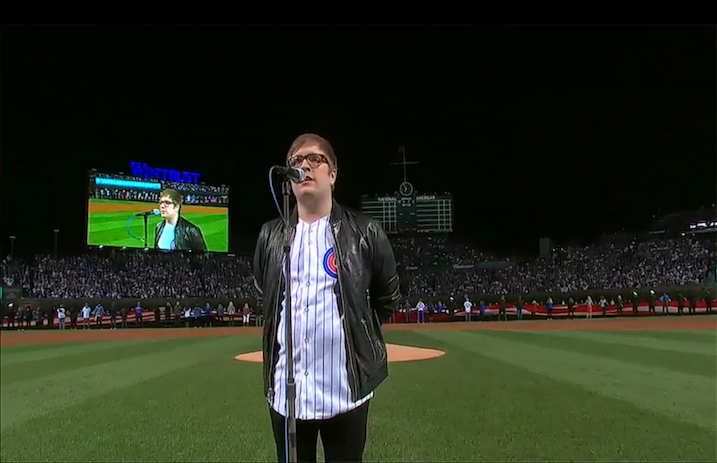 This is not the first time Fall Out Boy has been represented at Wrigley Field. They performed before Opening Day of the 2015 MLB Season. “When our band all lived in an apartment together in Roscoe Village, we used to pass out fliers for shows at the Metro after games. It has been a lifetime dream to get the chance to play at Wrigley Field. We are grateful to MLB for the opportunity and so excited to perform for our hometown crowd,” said Wentz, when asked about performing at Wrigley. What did you think of Stump's performance? Let us know in the comments!